When you are dealing with a clogged drain, or you want to prevent the clogging of pipes in your home, you may want to consider chemical drain cleaners. If you are in need of a chemical drain cleaner you will see that they can be found in two different forms – alkaline or acidic. The chemical drain cleaners, hand held augers and even the enzymatic drain cleaners can be effectively used when the clog is close to the opening of the drain. If you have a clog deep in the pipes or your drain has solid obstructions and it cannot be unclogged with a chemical cleaner, than electric cleaners such as plumber’s snake may be used. Alkaline drain openers can be found in liquid or in solid form. Most of these drain cleaners will contain sodium hydroxide in them. However, there are some that have potassium hydroxide. Most people prefer these products because they are inexpensive, easy to use and widely available. They are very strong and work quite well on regular drain clogs. Some people do not wait until it’s too late and use drain cleaning products when there is no clog in order to prevent one. Some of the alkaline drain cleaners may come in two parts. Each part will then be poured into the drain and form gas, along with a dense foam. That foam is what will cover the inside of your drain system and unclog the drain. Chances are that if you have ever bought or used any chemical drain cleaner they were alkaline based. Another type of chemical drain cleaners are acidic drain openers. Anyone who uses these products will find that they are made up of sulfuric acid. Professionals that have used these products before can tell you that they are really good at breaking down fats, proteins, and even tissue paper that has started to dissolve. While you might think that this is the type of product you want to use, there are several serious warnings related to this acidic chemical drain cleaner. Due to these risks acidic drain cleaners are sold to and used by professional plumbers and are available only in specialized stores. First off, it is very important to know that acidic drain openers can be very hazardous if they come into contact with water. There are also very serious health conditions that could develop if someone is breathing in the vapors. This is certainly not a chemical that should be misused. Anyone that is planning on using this product will need to make sure that they are pouring it into the drain very slowly so that it does not spill or come into contact with their skin. It would even be a good idea to wear a mask when pouring it. Our advice, leave the acidic drain cleaners to the professionals. There are a number of pros and cons related to the chemical drain cleaners that are out there. We will start by looking at the pros. Of course, anyone that has tried to look for a chemical drain cleaner in the past can tell you that it is very easy to find. You are not going to have any trouble finding a drain cleaner to help unclog your drains when you need it. People are also going to discover that many of the products that are on the market today are not going to be as harmful as they were in the past. In fact, many of them are going to be a lot safer than you would think. Ease of use is just one more positive that you should keep in mind. There is not going to be any special education or training needed in order to use these products. 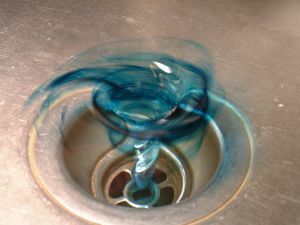 All you have to do is open the bottle and then pour the chemical drain cleaner down the drain. It really is that simple, just make sure you read the manufacturers’ instructions before you use it as some brands and types of products might be somewhat different. Also, consider the fact that you will be saving money as well because there are no special tools needed when it comes to using household drain cleaners. All you have to pay for is the product itself. Nonetheless, there are also some negatives related to the chemical drain cleaners that are out there. One of the major negatives about using the chemical drain cleaner that it may take more than one application of drain cleaner to get rid of the clog that you are dealing with. This can be very frustrating for some people and they are not going to be happy with the results that they are getting because they want an immediate fix. The good news is that most drain cleaners contain enough cleaner to be used several times. Another drawback may be a simple fact of using chemicals in your household. While most drain cleaners available to general public are relatively safe to use, they still contain chemicals that may be harmful if instructions are not followed properly. If you prefer to have chemical free household, consider making a homemade drain cleaner or using manual drain opener such as plumber’s snake. ALWAYS follow manufacturers’ instructions when using chemical drain cleaners. NEVER mix several types of chemical drain cleaners or mix them with other chemicals, because that may cause strong reactions and result in serious injuries.